Alternative abugida or alphabet according to the "mode"
First article of the Universal Declaration of Human Rights in English, written with a spelling-based pointed mode of tengwar. The tengwar are an artificial script created by J. R. R. Tolkien. Within the fictional context of Tolkien's legendarium, the tengwar were invented by the Elf Fëanor, and used first to write the Elven tongues Quenya and Telerin. Later a great number of languages of Middle-earth were written using the tengwar, including Sindarin. Tolkien used tengwar to write English: most of Tolkien's tengwar samples are actually in English. According to The War of the Jewels (Appendix D to Quendi and Eldar), Fëanor, when he created his script, introduced a change in terminology. He called a letter, i.e. a written representation of a spoken phoneme (tengwë) a tengwa. Previously, any letter or symbol had been called a sarat (from *sar "incise"). The alphabet of Rúmil of Tirion, on which Fëanor supposedly based his own work, was known as Sarati. It later became known as "Tengwar of Rúmil". The plural of tengwa was tengwar, and this is the name by which Fëanor's system became known. Since, however, in commonly used modes, an individual tengwa was equivalent to a consonant, the term tengwar in popular use became equivalent to "consonant sign", and the vowel signs were known as ómatehtar. By loan-translation, the tengwar became known as tîw (singular têw) in Sindarin, when they were introduced to Beleriand. The letters of the earlier alphabet native to Sindarin were called cirth (singular certh, probably from *kirte "cutting", and thus semantically analogous to Quenya sarat). This term was loaned into exilic Quenya as certa, plural certar. The sarati, a script developed by Tolkien in the late 1910s and described in Parma Eldalamberon 13, anticipates many features of the tengwar: vowel representation by diacritics (which is found in many tengwar varieties); different tengwar shapes; and a few correspondences between sound features and letter shape features (though inconsistent). Even closer to the tengwar is the Valmaric script, described in Parma Eldalamberon 14, which Tolkien used from about 1922 to 1925. 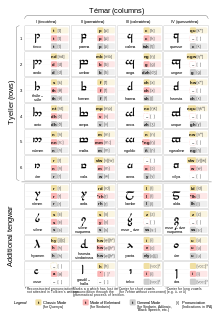 It features many tengwar shapes, the inherent vowel [a] found in some tengwar varieties, and the tables in the samples V12 and V13 show an arrangement that is very similar to one of the primary tengwar in the classical Quenya "mode". Jim Allan (An Introduction to Elvish, ISBN 0-905220-10-2) compared the tengwar with the Universal Alphabet of Francis Lodwick of 1686, both on grounds of the correspondence between shape features and sound features, and of the actual letter shapes. The tengwar were probably developed in the late 1920s or in the early 1930s. The Lonely Mountain Jar Inscription, the first published Tengwar sample, dates to 1937 (The Hobbit, most editions with colour plates). The full explanation of the tengwar was published in Appendix E of The Lord of the Rings in 1955. The Mellonath Daeron Index of Tengwar Specimina (DTS) lists most of the known samples of tengwar by Tolkien. DTS 50/51 – Edwin Lowdham's Manuscript from The Notion Club Papers has Old English language text written in tengwar (with a few Adûnaic and Quenya words), dating to 1945/6. DTS 10 – The Brogan Tengwa-greetings, appearing in The Letters of J. R. R. Tolkien, No. 118, tentatively dated to 1948. The following samples presumably predate the Lord of the Rings, but they were not explicitly dated: DTS 16, DTS 17, DTS 18 – Elvish Script Sample I, II, III, with parts of the English poems Errantry and Bombadil, first published in the Silmarillion Calendar 1978, later in Pictures by J. R. R. Tolkien, as well as DTS 23 – So Lúthien, a page of the English Lay of Leithian text facsimiled in The Lays of Beleriand:299. The tengwar table, with the name of each tengwa. The most notable characteristic of the tengwar script is that the shapes of the letters correspond to the distinctive features of the sounds they represent. The Quenya consonant system has 5 places of articulation: labial, dental, palatal, velar, and glottal. The velars distinguish between plain and labialized (that is, articulated with rounded lips, or followed by a [w] sound). Each point of articulation, and the corresponding tengwa series, has a name in the classical Quenya mode. Dental sounds are called Tincotéma and are represented with the tengwar in column I. Labial sounds are called Parmatéma, and represented by the column II tengwar; velar sounds are called Calmatéma, represented by column III; and labialized velar sounds are called Quessetéma, represented by the tengwar of column IV. Palatal sounds are called Tyelpetéma and have no tengwa series of their own, but are represented by column III letters with an added diacritic for following [j]. Similarly shaped letters reflect not only similar places of articulation, but also similar manners of articulation. In the classical Quenya mode, row 1 represents voiceless stops, row 2 voiced prenasalized stops, row 3 voiceless fricatives, row 4 voiceless prenasalized stops, row 5 nasal stops, and row 6 approximants. Most letters are constructed by a combination of two basic shapes: a vertical stem (either long or short) and either one or two rounded bows (which may or may not be underscored, and may be on the left or right of the stem). These principal letters are divided into four series ("témar") that correspond to the main places of articulation and into six grades ("tyeller") that correspond to the main manners of articulation. Both vary among modes. Each series is headed by the basic signs composed of a vertical stem descending below the line, and a single bow. These basic signs represent the voiceless stop consonants for that series. For the classical Quenya mode, they are /t/, /p/, /k/ and /kʷ/, and the series are named tincotéma, parmatéma, calmatéma, and quessetéma, respectively; téma means "series" in Quenya. Doubling the bow turns the voiceless consonant into a voiced one. Raising the stem above the line turns it into the corresponding fricative. Shortening it (so it is only the height of the bow) creates the corresponding nasal. In most modes, the signs with shortened stem and single bow do not correspond to the voiceless nasals, but to the approximants. In addition to these variations of the tengwar shapes, there is yet another variation, the use of stems that are extended both above and below the line. This shape may correspond to other consonant variations required. Except for some English abbreviations, it is not used in any of the better known tengwar modes, but it occurs in a Qenya mode where the tengwa Parma with extended stem is used for /pt/ and the tengwa Calma with extended stem is used for /kt/. The tengwar with raised stems sometimes occur in glyph variants that look like extended stems, as seen in the inscription of the One Ring. The basic sign, named parma, (with descending stem) represents /p/ (it happens to look much like the Latin letter P). With the bow doubled, umbar, it represents /b/. With a raised stem, formen, it represents /f/. With a raised stem and a doubled bow, ampa, it represents generally /v/ but possibly /mp/ (depending upon the language). With a short stem and double bow, malta, it represents /m/. With short stem and single bow, vala, it represents /w/, or /v/ if that has the phonological behaviour of a sonorant (as e.g. in Quenya). In some languages such as Quenya, which do not contain any voiced fricatives other than "v", the raised stem + doubled bow row is used for the very common nasal+stop sequences (nt, mp, nk, nqu). In such cases, the "w" sign in the previous paragraph is used for "v". In the mode of Beleriand, found on the door to Moria, the bottom tyellë is used for nasals (e.g., vala is used for /m/) and the fifth tyellë for doubled nasals (malta for /mm/). There are additional letters that do not have regular shapes. They may represent, e.g., /r/, /l/, /s/ and /h/. Their use varies considerably from mode to mode. Some aficionados have added more letters not found in Tolkien's writings for use in their modes. A tehta (Quenya "marking") is a diacritic placed above or below the tengwa. They can represent vowels, consonant doubling, or nasal sound. As Tolkien explained in the ROTK appendix, the tehtar for vowels resemble Latin diacritics: circumflex (î) /a/, acute (í) /e/, dot (i) /i/, left curl (ı̔) /o/, and right curl (ı̓) /u/. Long vowels, excepting /a/, may be indicated by doubling the signs. Some languages from which /o/ is absent or in which compared to /u/ it appears sparsely, such as the Black Speech, use left curl for /u/; other languages swap the signs for /e/ and /i/. A vowel occurring alone is drawn on the vowel carrier, which resembles dotless i (ı) for a short vowel or dotless j (ȷ) for a long vowel. Just as with any alphabetic writing system, every specific language written in tengwar requires a specific orthography, depending on the phonology of that language. These tengwar orthographies are usually called modes. Some modes follow pronunciation, while others follow traditional orthography. Some modes map the basic consonants to /t/, /p/, /k/ and /kʷ/ (classical mode in chart at right), while others use them to represent /t/, /p/, /tʃ/ and /k/ (general mode at right). In some modes, called ómatehtar (or vowel tehtar) modes, the vowels are represented with diacritics called tehtar (Quenya for 'signs'; corresponding singular: tehta, 'sign'). These ómatehtar modes can be loosely considered abjads rather than true alphabets. In some ómatehtar modes, the consonant signs feature an inherent vowel. These ómatehtar modes can be considered alphasyllabaries. Ómatehtar modes can vary in that the vowel stroke can be placed either on top of the consonant preceding it, as in Quenya, or on the consonant following, as in Sindarin, English, and the notorious Black Speech inscription on the One Ring. The other main difference is in the fourth tyellë below, where those letters with raised stems and doubled bows can be either voiced fricatives, as in Sindarin (general mode at right), or nasalized stops, as in Quenya (classical mode). In the full writing modes, the consonants and the vowels are represented by Tengwar. Only one such mode is well known. It is called the "mode of Beleriand" and one can read it on the Doors of Durin. Since the publication of the first official description of the Tengwar at the end of The Lord of the Rings, others have created modes for other languages such as English, Spanish, German, Swedish, French, Finnish, Italian, Hungarian and Welsh. Modes have also been devised for other constructed languages; Esperanto and Lojban. Tolkien has used multiple modes for English, including full writing and ómatehtar alphabetic modes, phonetic full modes and phonetic ómatehtar modes known from documents published after his death. The contemporary de facto standard in the tengwar user community maps the tengwar characters onto the ISO 8859-1 character encoding following the example of the tengwar typefaces by Dan Smith. This implies a major flaw: If no corresponding tengwar font is installed, a string of nonsense characters appears. Since there are not enough places in ISO 8859-1's 191 codepoints for all the signs used in tengwar orthography, certain signs are included in a "tengwar A" font which also maps its characters on ISO 8859-1, overlapping with the first font. For each tengwar diacritic, there are four different codepoints that are used depending on the width of the character which bears it. Other tengwar typefaces with this encoding include Johan Winge's Tengwar Annatar, Måns Björkman's Tengwar Parmaitë, Enrique Mombello's Tengwar Élfica or Michal Nowakowski's Tengwar Formal (note that most of these differ in details). The following sample shows the first article of the Universal Declaration of Human Rights written in English, according to the traditional English orthography. It should look similar to the picture at the top of the page, but if no tengwar font is installed, it will appear as a jumble of characters because the corresponding ISO 8859-1 characters will appear instead. Note: Some browsers may not display these characters properly. A proposal has been made by Michael Everson to include the tengwar in the Unicode standard. The codepoints are subject to change; the range U+016080 to U+0160FF in the SMP is tentatively allocated for tengwar according to the current Unicode roadmap. Tengwar are currently included in the unofficial ConScript Unicode Registry (CSUR), which assigns codepoints in the Private Use Area. Tengwar are mapped to the range U+E000 to U+E07F; see External links. The following Unicode sample (which repeats the one above) is meaningful when viewed under a typeface supporting tengwar glyphs in the area defined in the ConScript tengwar proposal. Some typefaces that support this proposal are Everson Mono, Tengwar Telcontar, Constructium, Tengwar Formal Unicode, and FreeMonoTengwar (James Kass's Code2000 and Code2001 use an older, incompatible version of the proposal). Tengwar has been used in Tolkien fandom since the publication of The Lord of the Rings in the 1950s. Tengwar script appears in a bound volume in the Within Temptation music video for "Stand My Ground" (2004), though it appears to be a random selection of letters, with a tehta vowel appearing about every five words or so. Many tengwar are also repeated for no apparent reason. Another instance of this stylistic use of tengwar is the computer game Atlantis: The Lost Tales (1997); again the tengwar are used meaninglessly. Tengwar is also used in Alone in the Dark, a comic book, as a typeface describing an arcane language. There has been a fashion of tengwar tattoos, especially in the wake of Peter Jackson's The Lord of the Rings film trilogy. Celebrities with such tattoos include Spanish footballer Fernando Torres and Argentine footballer Sergio Agüero. With the exception of John Rhys-Davies, the actors playing the Fellowship of the Ring in Peter Jackson's film trilogy have tattoos of the English word nine written in Quenya-mode tengwar. ^ It is a Quenya word which can be translated "letters"; see Lord of the Rings, Appendix E II Writing. ^ The Complete Tolkien Companion, Third Edition. Tyler, J.E.A. New York: St. Martins, 2004. ^ See Parma Eldalamberon 19 (2010), pp. 41–43. ^ Michael Everson. "Tengwar: U+E000 - U+E07F". ConScript Unicode Registry. Retrieved 2017-03-13. Derzhanski, Ivan A. "The Fëanorian Tengwar and the Typology of Phonetic Writing Systems." Vinyar Tengwar 41 (2000): 20-23. Hostetter, Carl F. ""Si man i-yulmar n(g)win enquatuva": A Newly-Discovered Tengwar Inscription." Vinyar Tengwar 21 (1992): 6-10. Smith, Arden R., Irmengard Rauch and Gerald F. Carr. "The Semiotics of the Writing Systems of Tolkien's Middle-earth." In Semiotics around the World: Synthesis in Diversity, I-II, ed. Irmengard Rauch, 1239-42. Berlin, Germany: Mouton de Gruyter, 1997. Wikimedia Commons has media related to Tengwar. Amanye Tenceli – The Tengwar A general presentation by Måns Björkman of the tengwar script, with some extrapolations.